Motorola(s goog) quickly followed Google’s Android Wear platform announcement with news of the Moto 360 smartwatch on Tuesday. Few actual details were shared and from images we’ve seen the watch looked more like a mockup than a real device, leading some to suggest the product doesn’t actually exist yet. 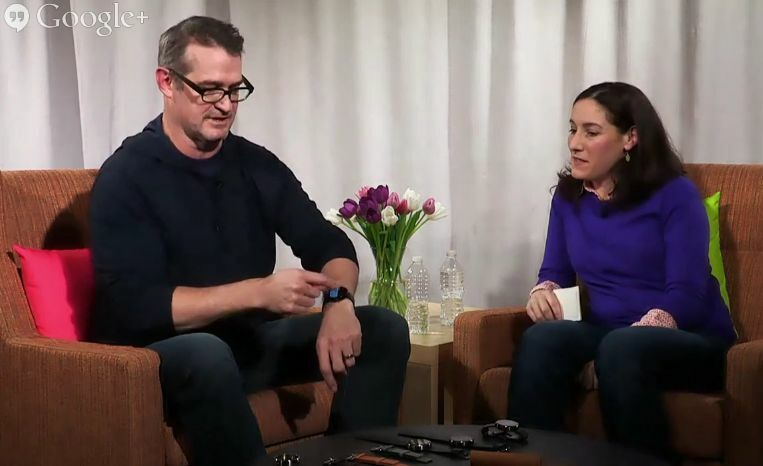 After watching a live video interview with Motorola’s head of Consumer Experience Design, Jim Wicks on Wednesday, I’m sure it’s the real deal although it’s clearly a beta product based on the state of the Android Wear developer preview. Wicks wore a Moto 360 throughout the interview and even swiped through screens. While I couldn’t tell what he was swiping through, it’s clear that it was functioning. Here are a few tidbits of information I picked up from Wicks; some of which confirms what we already suspected and some of which are entirely new. are more confirmation of what we thought and some bits are entirely new. You’ll always be able to see the time just by looking at the watch, which implies an always on screen or at least the option of one. The band can be changed by yourself or a professional, meaning it likely uses a traditional spring bar. I’m glad I picked up a small spring bar tool when I started collecting mechanical watches last year! There will be leather band options, and Wicks said that customization is important. I’m expecting a range of band colors, if not at launch, then soon after. It uses a card-based interface. We all figured that since Android Wear is based heavily on the card interface of Google Now used on Android, iOS and Google Glass. It suggests to me that we may not see skins atop the interface like we do on Android phones and tablets. How do you charge it? Motorola hasn’t said but Wicks did give some clues. There’s no USB interface to be seen — “people don’t want to see exposed electronics” — and charging details are part of Motorola’s “secret sauce”. That suggests wireless charging to me. And of the three main wireless charging groups, Motorola is a member of the Wireless Power Consortium, which backs the Qi standard of charging. The Moto 360 will work with all Motorola phones, naturally. And it will work with any other Android device with Android 4.3 software or better. You can flip the watch and the interface will auto-rotate. That means instead of being stuck wearing the Moto 360 on a left hand, you can flip it around to the right hand. The Moto 360 will be water resistant but not waterproof. There is no camera on the watch because Motorola”didn’t see it as essential”. I’m inclined to agree. Motorola said it plans to debut the watch this summer but couldn’t speak to the price. It does plan, however, to release the Moto 360 in various markets, just as it’s doing with its recent handsets. Say that to Samsung. They clearly haven’t get it. ArsTechnica has a nice technical review of the Android Wear Emulator. It’s remarkable how much functionality Google has baked into Wear API just be fully leveraging the existing Android Notifications API. Actionable notifications, now on your wrist without need for developers to do extra work if they already use the Notifications API. I agree on the size, I use a 41mm Citizen Navihawk (14 years old now) and it feels like the biggest I could handle. Hope I’m wrong, I want the Moto!